Al Hamdulillah and once more a heartfelt thank you to everyone who has been helping Healing Hearts in the last 17 years! 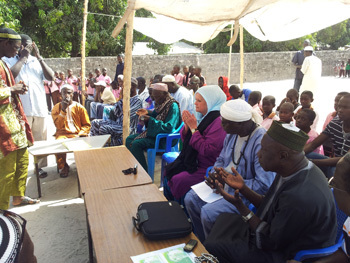 This is a short description of our projects during a trip in April 2013 to The Gambia. 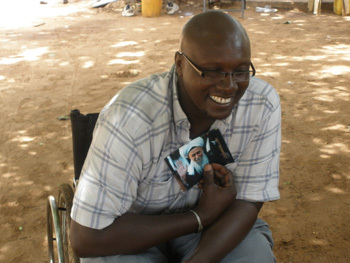 The difficulties for the disabled in The Gambia continue to increase. They still get no support from the government. Most of them have grown up relying on begging in front of hotels. This is not possible anymore, as the government is promoting The Gambia as a tourist attraction and beggars are not good for that image. 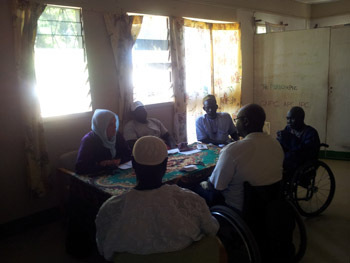 Healing Hearts has been supporting the GNPC for the last 14 years: sending wheelchairs, mosquito nets, rice, qurbanis, books and paying for their office costs. In 2012 they participated for the first time in the Paralympic Games in London, which was a tremendous achievement and gave them a huge boost. 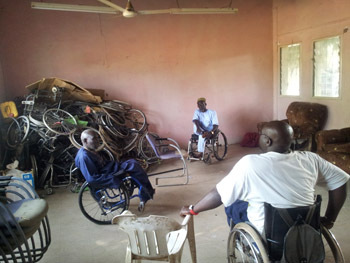 Apart from sports, the everyday lives of the disabled bring a lot of practical challenges, beginning with the maintenance of their wheelchairs. The roads in Africa are extremely bumpy, if they exist at all. The wheelchairs need to be repaired all the time. The GNPC have now found a suitable place to do this. If it works out, they even have plans to extend and have workshops for the disabled to learn other skills and not be dependent on begging anymore. We went to see the location, which seems to be perfect. The Naqshbandi group led by Sheikh Sarge, meets monthly for Zikr in the beautiful garden of the house which Bubacarr guards. Most participants are very poor and walk for miles in their best clothes to get there. The new building was ready! Spacious lofty rooms with big windows on both sides creating a lovely breeze. The collapse of one of the old buildings in the last rainy season turned out to be a blessing in disguise. 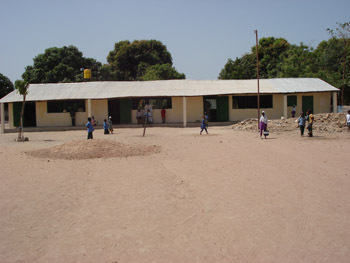 Now the pupils can learn in a much more pleasant environment. 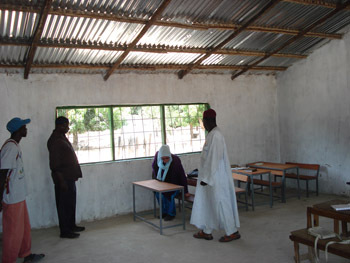 The school in Tanji and its 120 students are thriving. Like the school in Farato, they are continuously supported with tables and benches, books, stationery, uniforms and salaries for the teachers. There had been some misunderstandings as to how to distribute the funds (a mixture of school fees and our contribution), so we wrote a contract between Healing Hearts and each of the schools. New Yundum is a growing new settlement with a population of more than a thousand and no water. 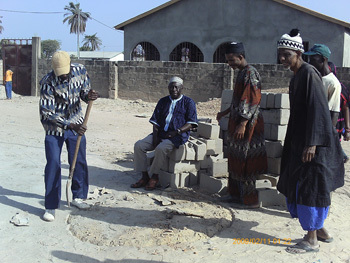 Having established a good working experience with the Mayor and his Deputy during the building of the last 3 wells, we decided to build our next well in New Yundum too. 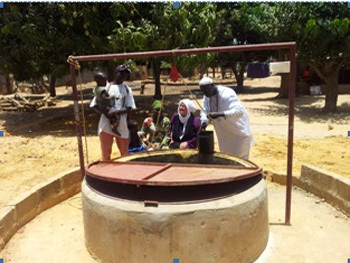 President Jammeh is encouraging people to move out of the towns and become self sufficient in rural areas. More and more new settlements are established, all of them lack water. Kombo Kerawan is such a place and Healing Hearts has now built the first well there. 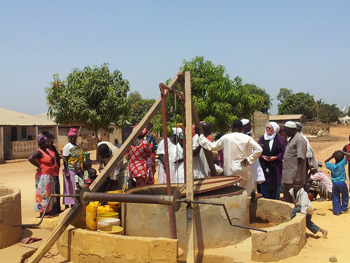 One of the heaviest rainy seasons ever in 2012 caused a well in Lamin Village to collapse. Healing Hearts built a new one next to it. Sheikh Sarge testing the new water...sparkling clean! 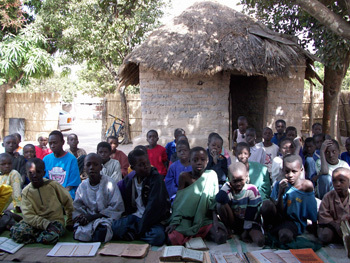 For the last 14 years Modou from Guinea has covered thousands of Naqshbandi Tawihs with a beautiful coat of leather. 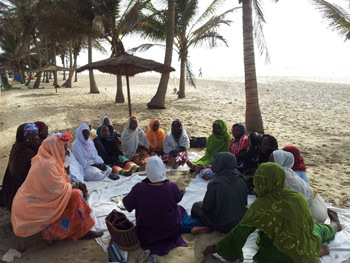 We first fold, cover them 7 times, have them blessed by Maulana and then bring them to The Gambia for the final leather. 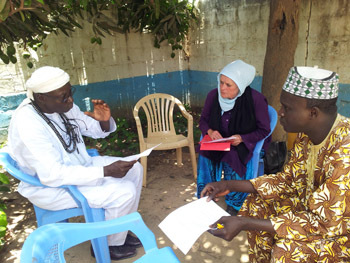 Hundreds have been distributed in The Gambia where many people still often mix their Islam with old african spiritualistic traditions. As soon as we arrive they will ask: 'Did you bring any Juju?' We then give them some Tawihs, explain what is written in there and usually give them a photograph of Maulana too. 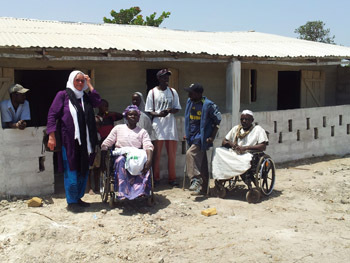 In 2012 Healing Hearts distributed 17 775 kg of rice and 29 qurbanis in The Gambia to the disabled, the needy and the orphans of Kembo Jay. 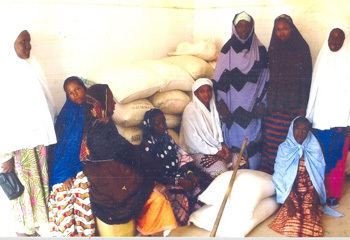 Since last year we have an ongoing project to distribute a 50 kg bag of rice to each of the 36 Handicapped Ladies and the Traditional Healers of war-torn Timbuktu as often as possible. 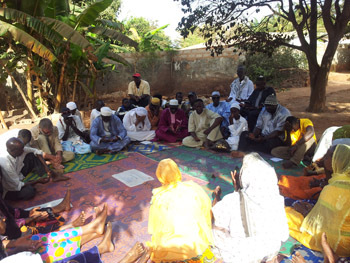 In 2012 Healing Hearts distributed 14 494 kg of rice and 119 qurbani in Mali. For the time being the political situation is better: people are grateful that the Salafis, with their ungodly brutal disrespectful behaviour are gone and that people can once more live their traditional lives. But the war has left its traces: there is food rationing, no banks operate and many are still refugees in Bamako and have not returned to Timbuktu. They are not convinced that the peace will hold. As long as drones continue to operate above Timbuktu, silently killing many civilians 'by mistake', life cannot get back to normal and the people of Timbuktu, especially the disabled, need our prayers and help more than ever. 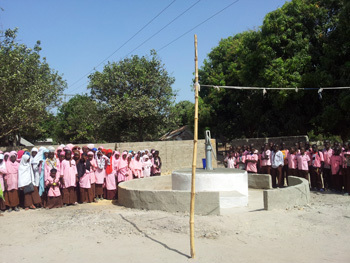 Some of our big projects like building wells or schools, are one offs, but a lot of what we do involve regular salaries. It is a relief to be able to create jobs and not just hand out charity. For those of you who are taxpayers in the UK, please download the GiftAid Form on our website and send it to us, then we can claim 28% on top of what you donate from the government. Wa salaama and thank you so much, al Shukrulillah!